This recollection relates to snippets of memories concerning childhood trips to the beach in the school summer holidays. They are the memories of a 5 – 7 year old with the added perceptual distortion of 50 odd years and the prism of rose tinted spectacles. I’ll mention why we resorted to the coast and I was growing up at Holland on Sea; the route we took to the beach and what was different then on the way; what we took; and, what we did when we were there. One of the consequences of the local government reorganization of 1964 was that we moved to Holland on Sea in 1966 following work, the opposite of a later trend. My father worked in an administrative role for the Essex Area Health Authority. Their offices were in Ilford which before the reorganization were in Essex and afterwards were in the London Borough of Redbridge. The authority therefore decided to relocate to Clacton on Sea and build a new office block in Carnarvon Road (next to the library). Whilst that was being built, they had temporary offices in the old Queen’s Theatre at King’s Avenue junction with Kings Parade. He initially stayed in a boarding house in Madeira Road and later rented a bungalow in Dulwich Road, while we remained in Ilford until a permanent move could be arranged. When it was available, we moved in to a new house in Pickers Way and our grandparents just down the road. Our grandparents rode in the lorry with the furniture and removal men and the rest of the family came to Clacton by train complete with our goldfish in a large jam jar and hamster in its cage. 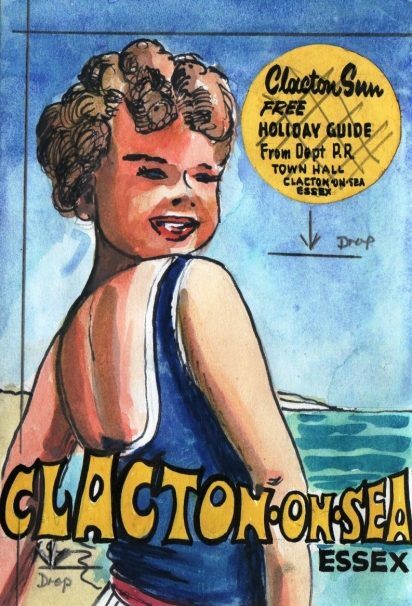 The family weren’t totally unfamiliar with the area as Mum (Betty Monk) and Nan (Rosa Levesque) and Grandad (John Levesque) had been on holiday to Clacton on Sea in 1936. There are memories of memories of this holiday. The summer holiday routine was to meet my Dad on the prom for a picnic lunch once or twice a week. First though my Mum would visit my Nan and prepare lunch for her, we would go as well. We would collect the picnic from home and then walk to the seafront. Sometimes we picked up a pasty each from the Windmill Bakery in Holland Road – it is still there. We took the shortest route to the spot where we met Dad. Pickers Way; Fleetwood Avenue; Grenfell Avenue; Kent’s Avenue; Norman Road; Holland Road; York Road; and down the steps to the beach. It zig-zagged a bit, but it seemed shorter, even though the shortest route appeared to take “forever”. I had friends that lived dotted along the first part of the route in Fleetwood Avenue, Grenfell Avenue and Kent’s Avenue. Fleetwood Avenue was mostly lined with immaculate newish bungalows and Grenfell Avenue was lined with immaculate newish houses. Some of them had a car outside, but they were never parked on the road. Kents Avenue and Norman Road had older buildings but they were equally immaculate and carless. The big difference in Norman Road, both from the previous roads and now, were mature trees: huge trees. Spaced at irregular intervals on the west side of the road on the grass verge, there were more then than now. At the junction of Norman Road and Holland Road in the big house opposite the Baptist Church lived the chemist that ran the Holland on Sea Chemists shop. On the opposite side of the road were the Police houses. One of them had a “blue lamp”, notice board and office; our village policeman lived in it. The office was closed when he was off duty or out on patrol on his bike. The police officers that lived in the other houses worked elsewhere. Next to the Baptist Church was an Off License – it never seemed to open: it’s now a restaurant. Next to that, as now, is the village hall and some bungalows. There were a number of large trees along the edge of the road, they are gone now. On the opposite side of Holland Road between Kenilworth Road and York Road were three buildings: a grocer and hardware shop; a chip shop; and a newsagents. Between each of the buildings was an empty plot of unkempt land over grown with brambles and nettles. The grocer and hardware shop was at the junction with Kenilworth. I think it is wider now than when it was a shop although it was a double fronted building. The shop door was just to the right of the middle of the building and led into the grocery part of the premises. The counter was at the back. There was a door through to the hardware part of the shop just inside the street door. The shopkeeper lived above. The chip shop is still there. It has more than doubled in size since we first knew it. It was only as wide as the present chip shop portion. The restaurant section being added later. The shop area was square with the counter and fryers across the width. The shop keeper lived on the premises. The news agent’s was a new single story building. That only comprised one storey of the corner section of the current building. The building evolved over the years firstly doubling in width, then getting another floor, and finally growing back down York Road – but this was later. At this time the land behind the newsagents in York Road was a wild plot of nettles and brambles. On the opposite side of York Road was a dairy which I seldom remember being open and was empty for years, before being a garden equipment shop and recently demolished for flats. York Road had older, but still immaculate bungalows. Again the road was free of parked cars. Towards the seafront end of York Road opposite the junction with Madeira Road the last bungalow before the sea was a tea room and seaside shop. Amongst other things it sold:- buckets and spades; fishing nets; sticks of rock; etc. Land between the bungalow and the seafront was an undeveloped plot. It now has flats on it. Across the road, Marine Parade, were the steps down to the promenade. This is where we waited for my Dad. While Mum carried the picnic, we carried our swimming things and bucket and spade. No bags were involved, just trunks rolled up in a towel under one arm and bucket and spade carried in the other. Also rolled up in the towel was the other essential piece of equipment – a rubber ring – to aid swimming as I couldn’t swim by myself then. On the hottest days we had a sun hat. The first thing we did was to wait in eager anticipation for Dad to come along the promenade. It always appeared to be a long time between us arriving and his joining us. Once he was with us we had our picnic. A fishpaste or meat paste sandwich and an apple. If we were lucky we would get an ice-cream afterwards. This would be bought from the café on stilts above the beach, or sometimes more excitingly if the tide was in, above the sea! The café was just west of the present “Flags” café, between Queens Avenue and King’s Avenue. Dad would go back to work after his lunch. If the tide was right we would get changed for a swim after a suitable wait for our lunch to go down. At this time, though, it was more of a splash and paddle. When we came out we dried ourselves and went back to play on the beach. If the tide was on the way in, we built a sand castle. If it was on the way out, we built dams and made “rivers”. All too soon it was time to go home as Mum had to cook her Mum’s tea before doing ours. We went home the same route as we came.